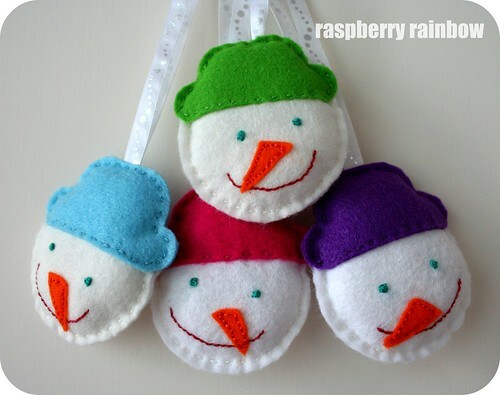 Raspberry Rainbow: Four happy snow men, all in a row. Four happy snow men, all in a row. I am finishing up lots of little sewing projects, now that I have found where to buy stuffing in Hong Kong. Four little happy snow men heads, all finished. They really are so cute. The felt works much better than the linen I used last time. 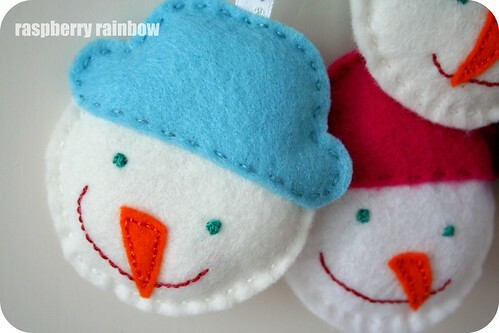 The snow man pattern can be found here. Have a great day, Cat. These are so cute, I love their twinkly eyes and all of the lovely even little stitches! They are so cute!! lovely and bright too!